Violent clashes have broken out in a Paris suburb after police tried to arrest a Muslim woman for wearing a veil. 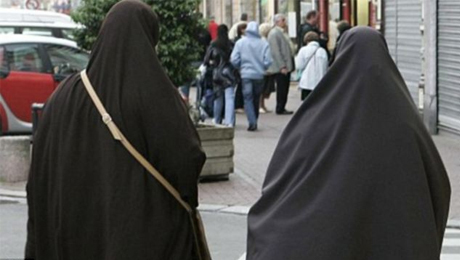 It came as two men today put a 21-year-old pregnant woman in hospital for covering her face with a veil on the same council estate. In what is being viewed as a severe test of France’s burka ban, around 60 people attacked police on Wednesday night in Argenteuil, a commuter town to the north west of the capital. Under a law which came into force in 2011, women found guilty of wearing niqabs in public can be fined the equivalent of around £130. 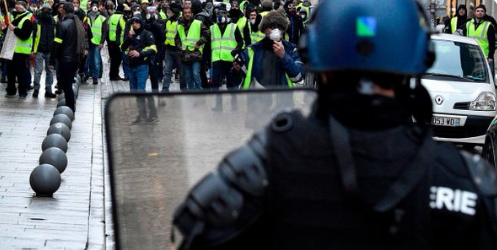 But when officers approached the unnamed woman, passers-by became involved in a ‘riot’ and police used tear gas and flash-ball shots to disperse them, according to a police source. ‘The police were attacked’ the source told Le Parisien newspaper. ‘They were insulted and beaten, including punches’. Two men aged 23 and 37, including a cousin of the young veil-wearer, were arrested and placed in custody under suspicion of violence and public order offences. In the end, 40 riot police had to be called to the area to restore order, said the source. Today, the 21-year-old was attacked in Argenteuil, with ‘two shaven-haired men tearing the veil from her face and pulling her hair,’ said a police source close to the case. She was rushed to the emergency ward of Argenteuil hospital where she underwent treatment for unspecified injuries. Police said that the men had shouted racist insults at the girl, saying that the veil was no longer acceptable in France. The attack may have been caught on CCTV, said the police source. In a third incident, police confirmed that a 17-year-old, identified only as Rabia, was attacked in Argenteuil on May 20th for wearing a veil. Two men beat her up at around 9pm, shouting ‘Dirty Arab’ and ‘Dirty Muslim’ while laughing. The 30-year-old, who cannot be named for legal reasons, said he was merely trying to ‘enforce’ his country’s laws when he carried out the attack in the city of Nantes. He approached the woman in a fairground in September last year and pulled away the veil. The man, who originally gave a false identity to police, said he was a firm believer in the law brought in by government of former President, Nicolas Sarkozy. But the judge said that he had acted like a ‘vigilante’ and carried out the attack solely because he was prejudiced against the women’s faith. Mr Sarkozy had described Muslim face coverings as an affront to the principles of the French Republic, saying that they could be used by both shoplifters and terrorists to hide their own identities. The incidents are all in a long line triggered by Mr Sarkozy’s ban. Last September, Louise-Marie Suisse, a Muslim teenager from Marseille received a two month prison sentence for biting a policewoman who arrested her for wearing a full-face veil.